Public space-fronting commercial buildings in New York City are under constant threat of privatization. The latest example: the public spaces along Water Street from Whitehall to Fulton Street. The area was heavily developed during the 1960s with a series of mostly bland towers (except 88 Pine by I.M. Pei Partners, 1968) that are noted more for their surrounding opens spaces than their corporate facades. Two towers in particular—77 and 200 Water Street, both developed by Melvyn Kaufman—have some of the most creative, playful, and useful public spaces in the city. Their designs were influenced by the writings of Holly Whyte and remain a testament to his belief in user-friendly public space. Back then, corporations were leaving the city in droves and New York developers fought back by creating useable, suburban mall-like public spaces. These Water Street plazas nearly all follow the same urban design pattern: a protected arcade just outside their lobby that works as a transition to a larger open plaza. 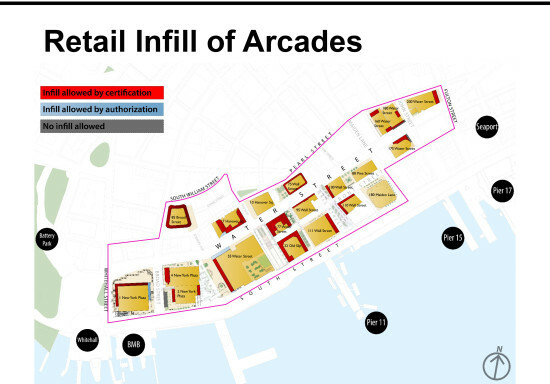 In exchange for these public arcades, the owners and developers were given an extra 2.5 million square feet of floor space. Now the building owners, supported by the Downtown Alliance and an increasingly out-of-touch Department of City Planning (DCP)—led by former Downtown Alliance president Carl Weisbrod—are trying a land grab. They want to turn these spaces into rentable square footage. With the Downtown Alliance taking the lead, the DCP is seeking a zoning change that would allow more than 110,00 square feet of public space along the half-mile strip from Whitehall to Fulton Street to become rentable land. Jessica Lappin, the current Downtown Alliance president, claims these spaces are “uninviting and underutilized” and “serve little public purpose.” Downtown Express has reported that this would provide more than $250 million in annual rent for the building owners. This rezoning would set a dangerous precedent for all public space in New York. The plan labeled ‘The Water Street Text Amendment” has been presented to the members of Community Board 1, which turned it down on February 23, but has now been approved by a single vote in the March 22 board meeting. Its supporters continue to push for this problematic zoning change and it will receive a final vote by the New York City Council.